It's worth a thousand words, for sure. You can tell a lot just by looking at it. But not everything. Here's 10 things this picture won't tell you. 2. Her name: Barbie Ritzco. Her name always makes me think of a Barbie doll, which is about the furthest thing from who this Barbie is. 3. She's tough. Breast cancer forces everyone to toughen up, but Barbie was uniquely qualified to fight it. As of this year, she's served 20 years in the marines. 5. She ran the Marine Corps marathon during radiation, on the heels of eight rounds of chemo and a bilateral mastectomy. Her Facebook page, Twitter and Instagram are all called Marathon Barbie. 6. The above explains one reason Barbie is known in her breast cancer community by another name: The Warrior Queen. 7. She co-founded Flat and Fabulous, where I first heard about Barbie (this group of brave women is highlighted in my TED talk.) Says Barbie's co-founder Sara Bartosiewicz -Hamilton, "Barbie's vision of Flat & Fabulous was never to be a "cancer" group -- she wanted a place to EMPOWER women who were living without reconstruction ..She was adamant that we focus our efforts on the spiritual/emotional healing and pushing our F&F sisters to embrace their beauty." 8. She's inspiring. To everyone who knows her, and many who don't. She was proud to be part of the Scar Project, and has reached out to encourage many other women via social media. When they first started their group on Facebook, Barbie remarked to Sara: "We are gonna make it big one day so we need to use Twitter! One day we can be on Ellen." Need your good juju and healing energy. Unfortunately my breast cancer has recurred... I think of this as a detour on my journey. I am an innately positive person and nothing will ever change that, but now more than ever I need your support. I will be taking time to focus on my healing. Three years ago when I joined Beyond the Pink Moon, our founder Nicki lovingly nicknamed me the Warrior Queen because I never give up. I never will. 10. Barbie is currently in the ICU, experiencing complications. Sara wrote about what she decided to do for Barbie: "She is quite proud of her tattoo and she wanted to the world to see that she truly is FABULOUS. She always wanted this photo to go viral. Let's help do that for her." 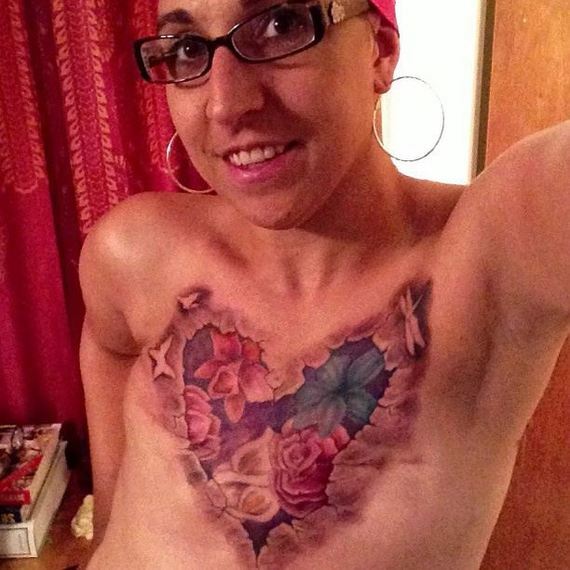 Darryle Pollack is a also a breast cancer survivor, and member of Flat and Fabulous. Her TED talk, blog and upcoming book are called I never signed up for this... honoring all the times she's said those words.